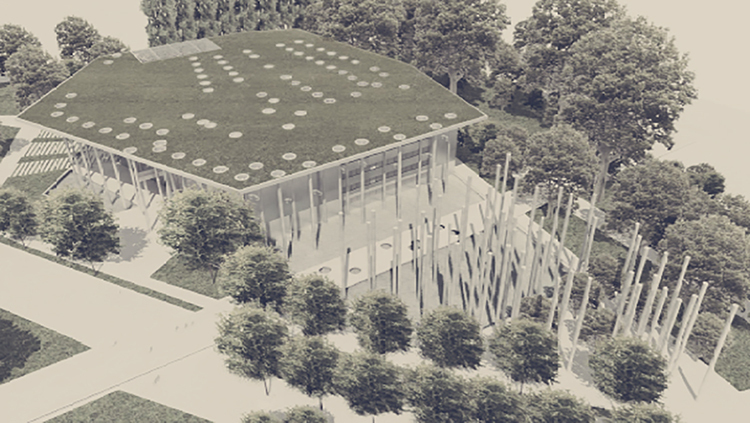 We planned the building located among the trees of the Liget in line with four fundamental principles. The House of Hungarian Music does not only address those visitors who enter though its gates and buy an entrance ticket. The building makes its presence known even beyond its outer walls, on the one part with the sounds made by the organ pipes, and, on the other part, with the spectacle of the organ pipe columns outside of the building. The extended axis of the tree lined Liget Avenue leading to the National Gallery, as the most important pedestrian route in the area, is encompassed by the organ pipe columns, communicating the proximity of the institution with sounds and signs. The building, on the basis of the vision described above, is the architectural equivalent of the Allegro Barbaro through geometrical and metaphorical transpositions. During planning we concentrated on the basic cultural, civilisation and composition principles that Bartók held in respect as well. It is of fundamental importance in the Liget location that the building has intensive communication with the environment. 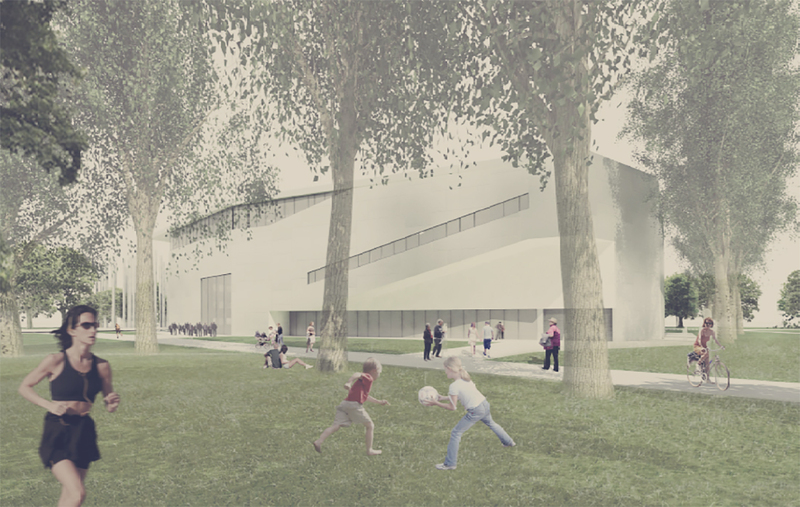 Although it was not a construction location, we also involved the triangular shaped plot on the other side of the Liget Avenue, continuing the Allegro Barbaro structure of the Museum. Further intensive contact with the environment comes from the entrances on the two opposite sides, the café’s large glass façade and frequented terrace, as well as from the open-air stage established next to it, the auditorium of which may even extend to the Olof Palme Avenue as well. The building’s internal organisation of space was fundamentally structured in a functional, rational, comprehensive, perpendicular coordinate system. At two points the system touches on different natural elements; with respect to the Allegro Barbaro column forest and the external environment. The planes of the façade walls extend beyond the perpendicular system and create their own self-determining composition order, with minor deviations, in such a way that may be associated with the distinct poly-modal structure of Allegro Barbaro. According to the geotechnical expertise’s results all soil layers are suitable for foundation. The building has raft foundation, piled raft if required. Electrical power supply of the building will be provided by an energy supply block located at the basement. Transformer station, 0.4 kV main distribution board, diesel generator and server room will be placed on the basement. Back-up supply will be provided by diesel generator. Today’s one of the important device are the information and IT systems. Information of the visitors will be done by touch screens located in the common areas and the continuous internet access will be provided by open WIFI network. The largest emphasis will be devoted to the installation of public address and sound system. We wish to provide possibility for the visitors to listen to the musical performances of the each room and also provide possibility to re-listen some musical performances. One centralized public address system will be installed in the building that has the capability to transmit the music as well. The transmission heat demand and the concentrated, large HMV heat demand has been ensured from the district heating network, in accordance with the specifications. The heat comes from a low-temperature radiation system (floor heating), the subordinate rooms have radiators with thermostatic radiator valves. We have planned to take the surplus internal and transmission heat from the building with an internal, water-cooled condensation cooler. The condenser of the coolers takes the extracted heat and passes it to the ground through a ground heat-exchanger coil. The cooling terminal devices are surface cooling systems (ceiling cooling), and fan coil devices in the high-load areas (lecture hall, café). The building includes several, well separated areas requiring air technology systems, these have independent air treatment systems and extraction ventilators. The planned air treatment systems are located on the roof, heating and cooling takes place with variable refrigerant flow, air-cooled, heat pump equipment (VRV). The equipment has been fitted with rotating drum or cross-flow heat recovery devices. The planned equipment has Eurovent classification and is in energy class “A”. All of the systems are planned for variable air volume flow (VAV). On the basis of the air quality and the presence sensors, the system is able to regulate the amount of air and fresh air going into the individual rooms, with which the amount of electricity consumed by the ventilators and the heating-cooling demand may be reduced.